The Thomas Cole National Historic Site is pleased to announce the start of a new series of contemporary installations entitled OPEN HOUSE: Contemporary Art in Conversation with Cole. The inaugural exhibition is with artist Jason Middlebrook and will be on view August 14 – October 30. A members’ opening event will be held on August 13, 5-7 pm. Open House: Contemporary Art in Conversation with Cole is a new series of contemporary art projects at the Thomas Cole National Historic site that explore the continued power and influence of Thomas Cole’s art and ideas. Operating from the concept that all art is contemporary, the program activates conversations between artists across the centuries. For this installation, Middlebrook is creating a site-specific exhibition inside the home of artist, Thomas Cole, in collaboration with the Thomas Cole site’s curator Kate Menconeri. This solo project, installed in conversation with works by Cole already within the house, will feature a selection of Middlebrook’s signature hardwood plank paintings and debut new works on paper, made for the occasion, that draw on Cole’s sketches of trees. Middlebrook lives and works in the Hudson Valley and has had solo shows at MASS MoCA and the New Museum, among other national and international venues. Middlebrook paints, sculpts, draws, and creates installations that explore the relationship between nature and culture, and often blur the lines between landscape and architecture, and art and object. 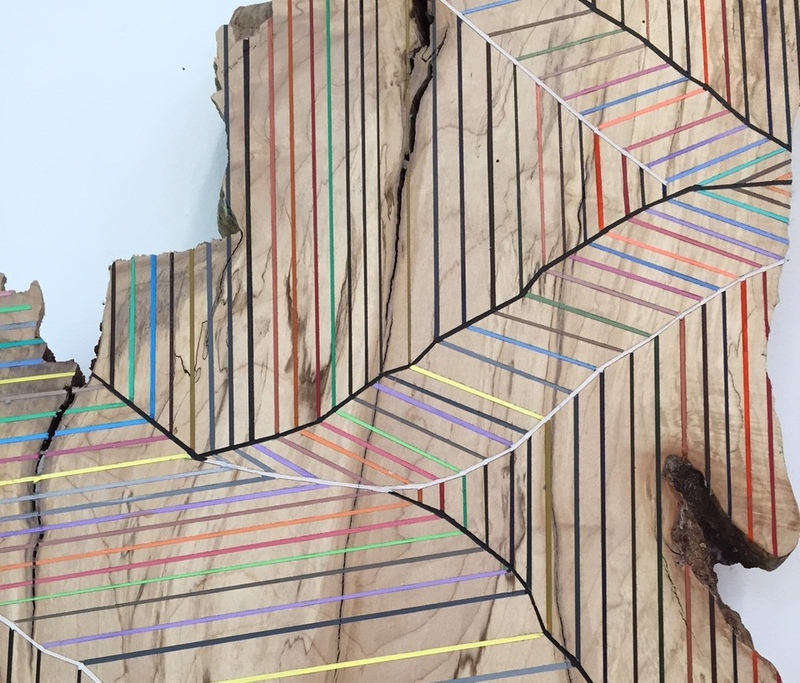 For his hardwood plank paintings the artist salvages lumber from a local mill and brings them back to his studio where he draws intricate lines of paint and colored patterns onto the wood. He paints the planks – maple, walnut, elm – with and against their natural grain – and in doing so intentionally acknowledges the complex stakes of human intervention in the natural environment. Middlebrook’s words and work echo questions that occupied Cole almost two decades earlier, and the artists share preoccupations with our quickly changing landscape, as well as our complicated and inextricable relationship with nature, raising questions such as how to balance the man-made with the organic and examiningwhat is at stake with unchecked development. Jason Middlebrook earned a BFA from the University of California at Santa Cruz before pursuing graduate work at the San Francisco Art Institute. From 1994 to 1995, he attended the Whitney Independent Study Program in New York. Middlebrook has exhibited his work extensively, including at institutions such as the New Museum in New York, the Whitney Museum of American Art in New York, MASS MoCA in North Adams, and the Museum of Contemporary Art Chicago, among others. His work was included in the 2014 SITE Santa Fe biennial. Meet Jason Middlebrook in our interview with the artist for the Open House Videos Series. Open House is collaborative by nature. Each year the Thomas Cole staff will invite one or two contemporary artists to create a site-specific project that engages with the art, writings, home and story of Thomas Cole. Projects may take the shape of an installation, a performance, a guided walk, or other format reflecting the artist’s practice and ideas. This program will seek artworks and ideas of the highest artistic merit, drawn from newly created or relevant pre-existing works, that shed light on the connections between 19th-century American art and contemporary times, and that specifically speak to the historic environments in which they are presented. That dialogue takes on a special significance because the artworks will be placed into the very spaces where Thomas Cole launched this country’s first major art movement, now known as the Hudson River School. This context offers artists working today a unique venue in which to realize a project. The goals of the project are to engage both current and new audiences with a presentation that departs from the expected “house museum” experience, to enable visitors to access the historic spaces from a new angle, to provoke new ideas about the meaning of the art and history of the mid-19th century, and to encourage audiences to confront the vast cultural shifts that distinguish Cole’s time from our own. The Thomas Cole National Historic Site was established as a creative and flexible institution from its beginnings. With the writing of its General Management Plan in 2004, the traditional “house museum” model of a static display of decorative arts was specifically rejected in order to accommodate a variety of educational initiatives. The Thomas Cole site’s senior staff members have a background in both historic and contemporary art: the Executive Director, Elizabeth Jacks, formerly worked at the Whitney Museum of American Art, and the site’s Curator, Kate Menconeri, has worked with contemporary artists for over a decade and holds a degree from the Center for Curatorial Studies at Bard College. In 2015, the Thomas Cole site in partnership with the nearby Olana State Historic Site organized and presented an exhibition of contemporary art that spanned the two sites that face each other across the Hudson River. The exhibition, entitled “River Crossings: Contemporary Art Comes Home”, was curated by the artist Stephen Hannock and the professor Jason Rosenfeld, and featured work by 28 artists including Chuck Close, Maya Lin and Cindy Sherman, whose work was integrated into the historic interiors of the two historic sites. The exhibition drew attention to the story of this part of the Hudson Valley as the place where American art was born in the early 19th-century, a place that continues to spark creativity and innovation among artists working today. The initiative also shattered attendance records at both sites and brought unprecedented media coverage including a feature on CBS Sunday Morning. Thomas Cole National Historic Site (TCNHS) preserves and interprets the home and studios of Thomas Cole, the founder of the Hudson River School of painting, the nation’s first major art movement. Located on 6 acres in the Hudson Valley, the site includes the 1815 Main House, 1839 Old Studio, the newly reconstructed 1846 New Studio, and several other buildings. It is a National Historic Landmark and an affiliated area of the National Park System. Following a restoration of the Main House, the TCNHS opened to the public in 2001. TCNHS activities include guided tours, exhibitions, printed publications, extensive online programs, activities for school groups, free community events, lectures, and innovative public programs such as the Hudson River School Art Trail—a map and website that enables visitors to see the nearby views that Cole painted. Each year, the TCNHS organizes a loan exhibition of Hudson River School paintings, providing a first-hand experience with the art movement that Cole founded. The goal of all programs at the TCNHS is to enable visitors to find meaning and inspiration in Thomas Cole’s life and work. The themes that Cole explored in his art and writings—such as landscape preservation and our conception of nature as a restorative power—are both historic and timely, providing the opportunity to connect to audiences with insights that are highly relevant to their own lives. Thomas Cole’s home, studios, special exhibitions, and grounds are open May – October, Tuesday – Sunday 9:30 to 5pm. For details see: www.thomascole.org.